Voting in the independence referenda held today in over 160 municipalities in Catalunya will close at 7pm and, thanks to the widget below, we should be able to see the results as they unfold, automatically updated every five minutes. independent, democratic and social, integrated within the European Union? I think I should give some explanation of the figures, since they will not be as straightforward as they might appear. 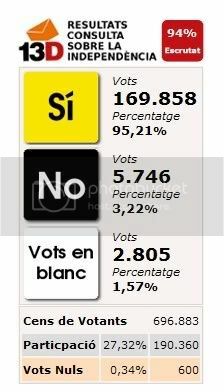 Because this is not an official poll, very few of those who would vote No or register an abstention by leaving the ballot paper blank (that's what "Vots en blanc" means) are likely to turn out. That means the Yes vote will probably be around the 90% mark. So the figure that really matters is the absolute number of Yes votes in relation to the electorate as a whole. In every normal election or referendum there will be those who either abstain or simply do not turn out to vote. It is impossible to be precise about how many would do so on this issue, but a figure of 25% was indicated in the OUC poll last weekend. However it should be noted that all opinion polls overestimate turnout because saying something is quite different from actually doing it, and in other elections and referenda in Catalunya the turnout has been lower, sometimes less than 50%. So in order to say the referendum has been won beyond any reasonable doubt, the Yes vote would need to be more than half of a high turnout of say 75% ... i.e. 37.5% or 263,000 as a round number. If we use a lower turnout figure, the number necessary to win will be correspondingly lower. I reckon that anything over 250,000 would be enough to claim victory. A Yes vote of 290,000 would equate (on the same 75%) to 55% of the vote. This is the threshold that the EU set in order to recognize the validity of the Montenegrin vote on independence from Serbia in 2006. Setting that figure was a controversial decision, since in most democratic situations only a simple majority of the vote is required. However, it seems obvious that if the vote (when conducted on a Catalunya-wide basis) were to be above 55% the EU would have no alternative but to accept Catalunya's independence. A Yes vote of above 350,000 would be a majority of the total electorate, and would justify dancing in the streets (not that dancing ever needs to be justified) until Christmas. The population of Catalunya is about 7.3m, so at a guess the total electorate is probably about 5.5m. These referenda therefore represent a sample of about 13% of the total electorate. As noted here, a further 250 municipalities were expected to conduct their own referenda next Spring taking the total to over 400. However, only a few days ago, Barcelona decided that its Comarca (with a total population of about two million) would hold a referendum on 25 April 2010. This means that a large majority of the population of Catalunya will by then have been given an opportunity to vote on independence. If things go according to plan, this will be enough to say with certainty whether or not there is a democratic mandate for independence ... irrespective of whether the Spanish State chooses to recognize it as legal. I've been searching for preliminary indications. They seem to show turnouts of over 30% in smaller towns, but lower than that for larger towns. El Periodico said 21.4% overall = 155,000 voters at 18:00 ... i.e. with two hours still to go. Some great posting on here at the mo MH, and I share your excitement! I'll be back after 7 to see how things are progressing! As a Plaid Town councillor though, I do wonder, if individual towns in Catalunya can do this, why can't we? Well done, MH. You've knocked the traditional media flat, again. Jill Evans all-day blog on this - cwmrhondda.com - seems to indicate our Catalan comrades might get the result they need. Excellent news you report about Barcelona too. A veritable psephological tsunami © in the making. Draig, of course we can do this here. They are called community polls. Properly called, they are even paid for my the council. The missing bit here is political leadership, the MEP honourably excepted. How strange! Major reports by BBC London, ABC News, France24, AFP, The Scotsman, Daily Telegraph, etc. Nothing on the so-called Welsh media. Remind you of the people who clocked off just before the attack on Pearl Harbour? Hi, this is Albert, from cataloniadirect.info, I want to thank Syniadau and the Welsh nation in general for covering what's happening in my country and for your support. I have to say that a 30% turnout is an extremely good result since the Catalan and Spanish media have largely (and intentionally) ignored the event until today and with the political parties either openly against it or not knowing what to do haven't helped much either. Just think that the last european elections got also a 30% turnout with full institutional backing and publicity. So an army of volunteers with barely no funding have achieved the same as the government. This is a popular initiative unlike anything before and shows how much we want to become a state within the EU. This has suceeded in many ways, it has helped to bring the independence debate to the first page of the political agenda and to give it the legitimacy that even most catalan politicians were denying it, to force all the parties to position themselves on the issue and to give an extremely important international visibility to the Catalan nation like I had never seen before. My happiness will only be greater the day we declare the independence. It's an amazing result given the voluntary nature of the poll and the ban on using state or municipal buildings. The Barcelona poll in 2010 will be hugely important and it seems a snowball has started to roll. Doubtless the Basques will follow suit with grassroots referenda and I see no reason why, in the right circumstances, we shouldn't do the same. noticed that golwg360.com have a piece about it this morning. BBC Wales and Western Mail - don't bother. Why hasn't any Plaid AM said something about this in the Senedd?